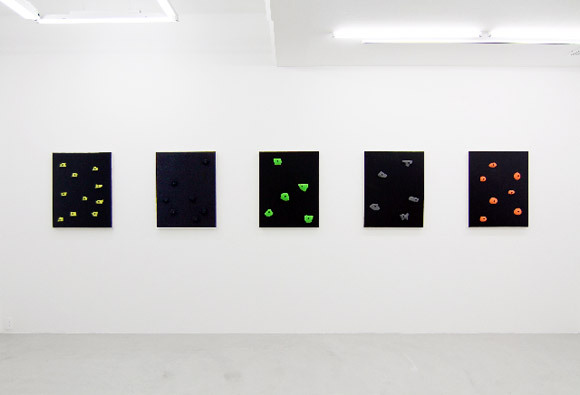 NANZUKA is pleased to announce the upcoming exhibition of new works by British artist Oliver Payne (b. 1977). This exhibition will be Oliver Payne’s first solo gallery exhibition. This exhibition will feature a new installation based on the theme of “camp”. A canvas with climing hold paste onto it remind us of old-type TV games, which ironically update the authority of painting in the capacity of Nature Imitating Art. A two-dimensional work of leather covered with dice as thorn makes us think of intimidating “enemy” that prevent anyone from coming near. A concrete video game console we can never play bizarrely presenting the boundary between “game brain” virtual reality-like thinking and our daily lives.